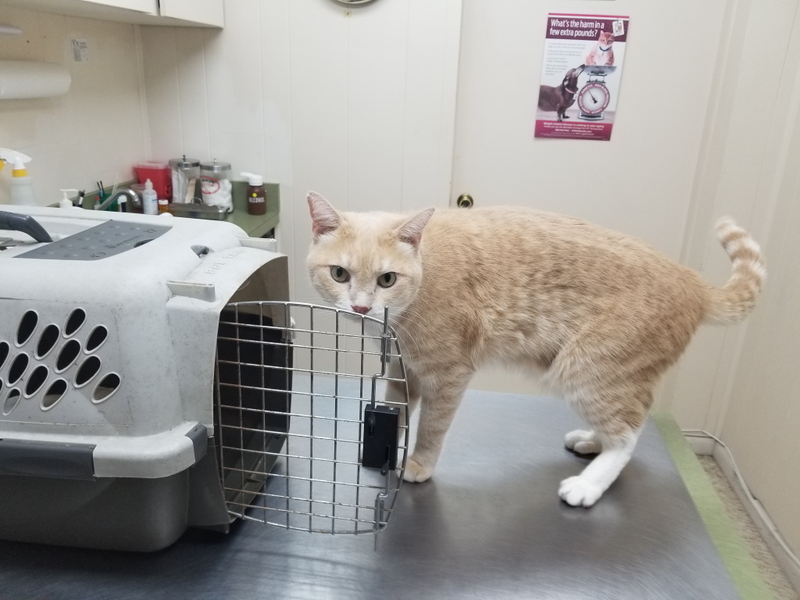 Recently we needed to bring Frankie to the vet to get his rabies vaccination so we could get him registered with the county. We needed to do that because the place we are moving to requires it. We also needed to bring Floki in to get his nails clipped so we thought we could bring them both at once. I inquired about the price and was told that an examination was required by the state and the cost would be well over a hundred dollars. I forgot the exact amount. I called the vet around the corner from them and they charged under $50 on Saturdays and Wednesdays, no examination needed. Hmmm. Anyway, we made an appointment at the rip off vet for Floki’s nail trimming that Saturday and decided that Rose would bring Floki to that appointment while I brought Frankie to the other vet for his shots. 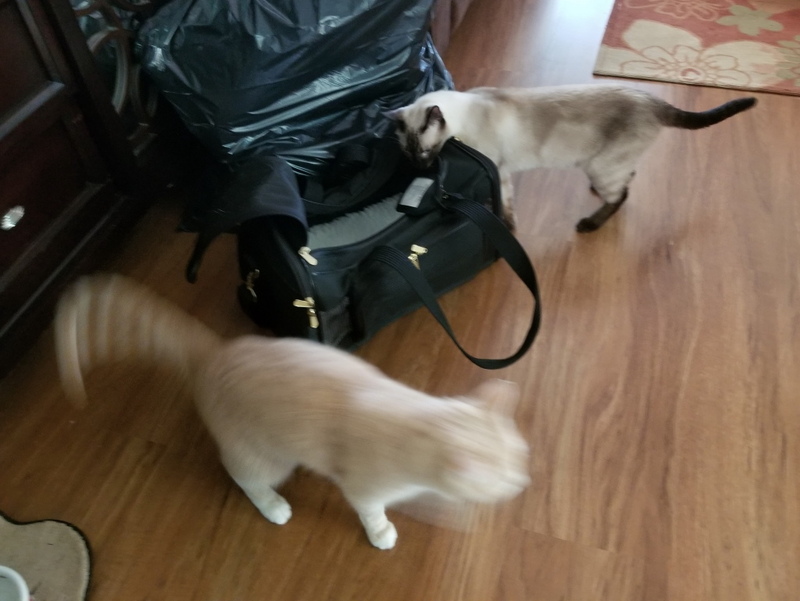 I brought two carriers inside very early that day so they could get used to them being there. It was Floki I was concerned about but he seemed indifferent about the carriers. Chris and Frankie were more interested. When it came time to go we decided to get Floki first because he was the most likely to run and hide. 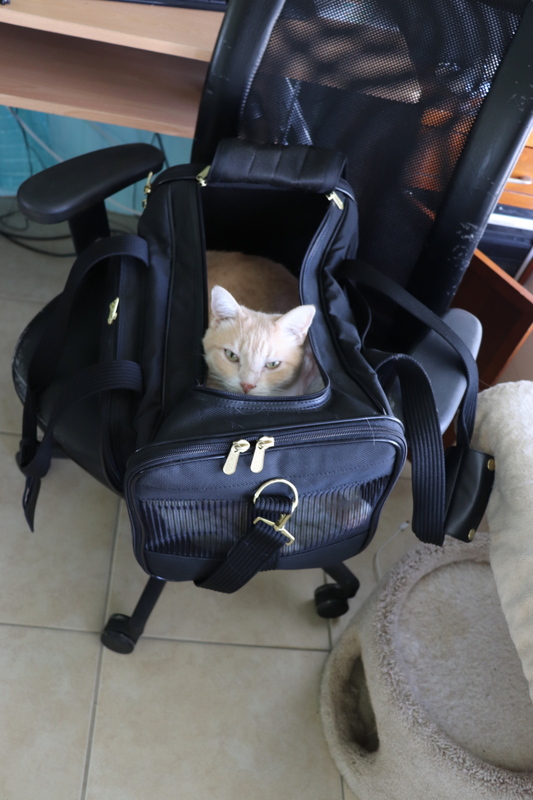 We recently bought a top loading carrier because Floki is so difficult to get in the carrier. He struggles like nothing I have ever seen before. Rose grabbed him and I assisted in shoving him inside and zipping it shut. Except the Tasmanian Devil managed to twist his way out and he disappeared down the hall and under the bed. We had to call the vet and cancel the appointment. I told them the truth, as embarrassing as it was. Frankie was much easier to deal with so Rose and I both brought him in for his shots. He seemed pretty comfortable in the vet’s office. There was so much to explore. After a short time, the vet came in, gave him his shot and license and we were home in no time. Now we need to find a new vet close to our new home. I don’t mind though because I have never been too impressed with our usual vet, especially after what happened to Puck. 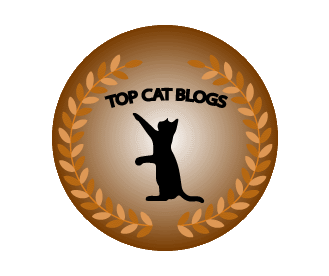 This entry was posted in Uncategorized and tagged carrier, Cats, shot, vaccination, vet on August 23, 2018 by Charles Huss. 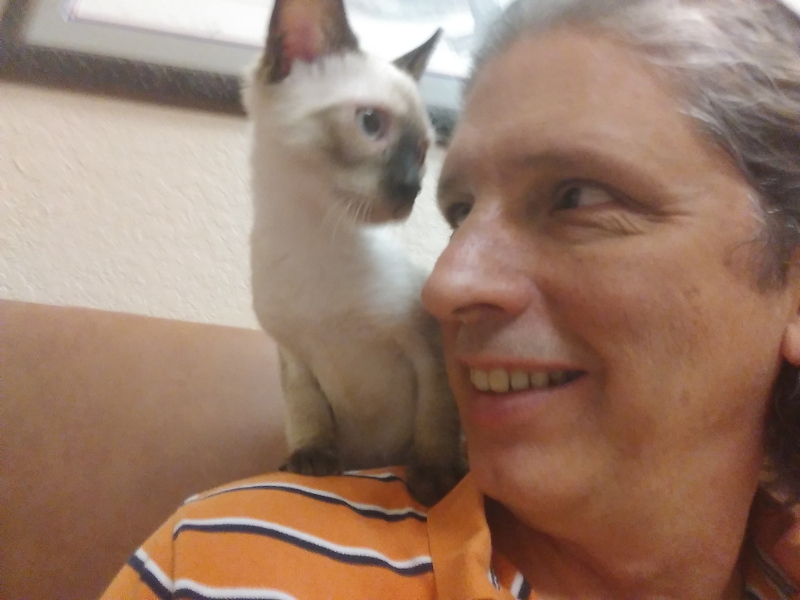 Since we hadn’t spent enough money on Frankie at the vet, we decided to bring Floki there on Friday. He had an 8 a.m. appointment, which gave me enough tome to go there with Rose before I had to leave for work. He needed to get the second in a three-part series of core vaccinations (tune in again in three weeks for the exciting conclusion). I’m not a big fan of vaccinations for indoor cats because of all the bad side effects that I have read about, but I will accept these. However, after the third set, that’s it. No more. I saw in interesting video this morning that talked about vaccination being good for life in most cases (although I only made it through the first twenty minutes). Essentially, annual booster shots are not only unnecessary, they add to your pet’s toxic load. The vet being interviewed, Dr. Ronald Schultz, said you should wait a minimum of 3-4 years, if ever, to get a booster shot, unless, of course, you worry about local antiquated regulations (those are my words). When we got to the vet Rose noticed a sign that said “Dogs will accept you as boss, cats want to s ee your resume.” How true is that? 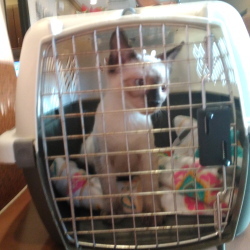 I felt bad that Floki shut in the carrier so I let him out in the waiting room. 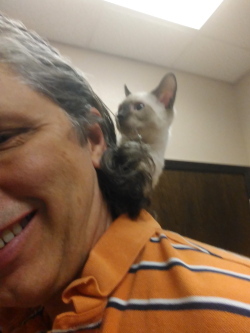 Once out, he climbed on my shoulders, which is something he has never done before. 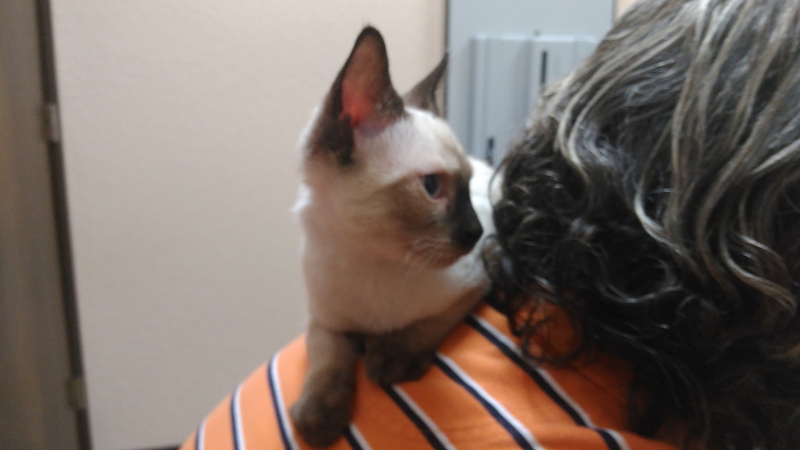 When they called us into the examination room, I just carried him in there on my shoulders. He stuck with me for a long time. 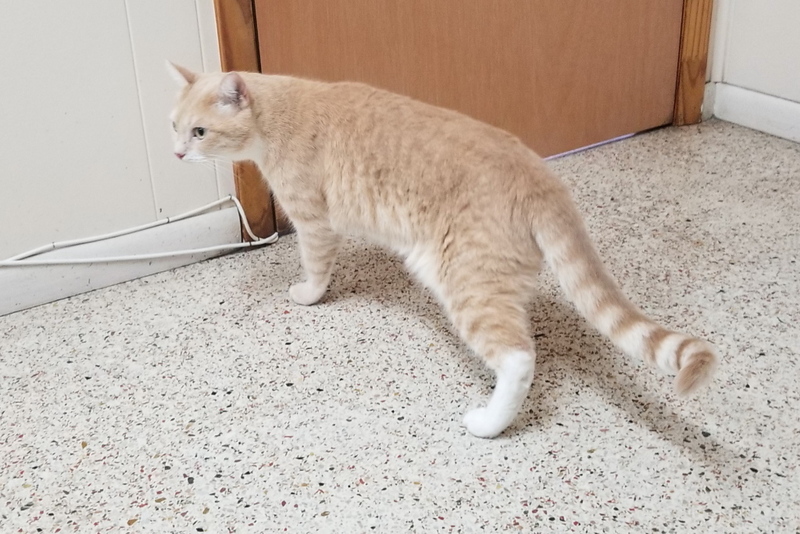 I assumed he would be ready to go exploring. He is a kitten after all. If that was Chris, he would be exploring every nook and cranny of that room. 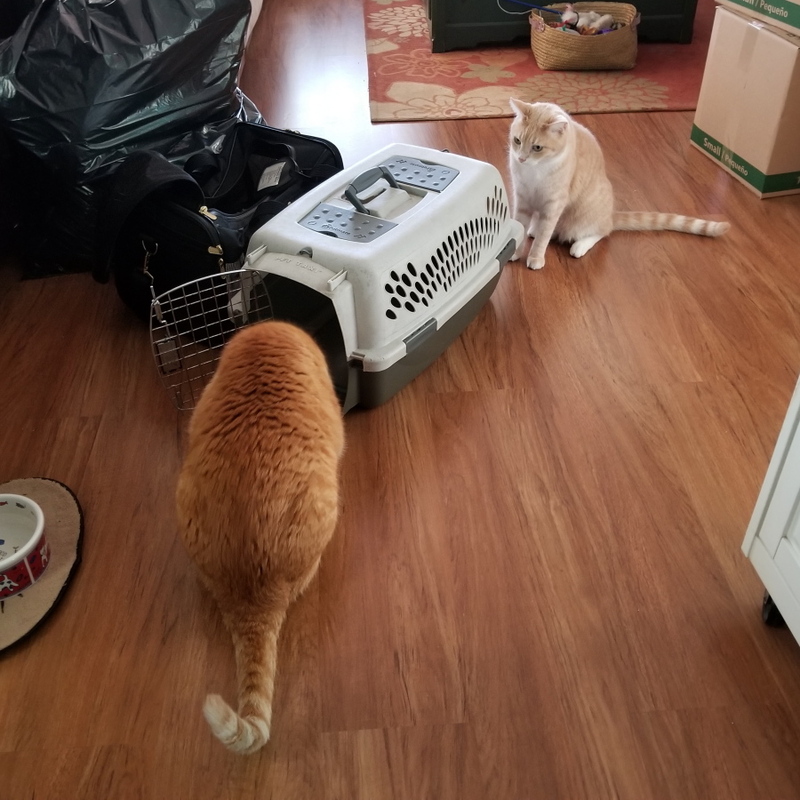 The vet tech came in and looked Floki over, which he was not happy about, before taking him in the back where they have their secret laboratory. When she brought him back he was up on my shoulders again. Rose and I were both away at work the rest of the day and as soon as I got home we had to leave again to meet Rose’s sister and her family for dinner. It was her last day here before returning to Massachusetts. When we finally got home around 9 p.m., Rose wanted to sit down with Floki on her lap but Floki wasn’t interested. In fact, he didn’t look well. 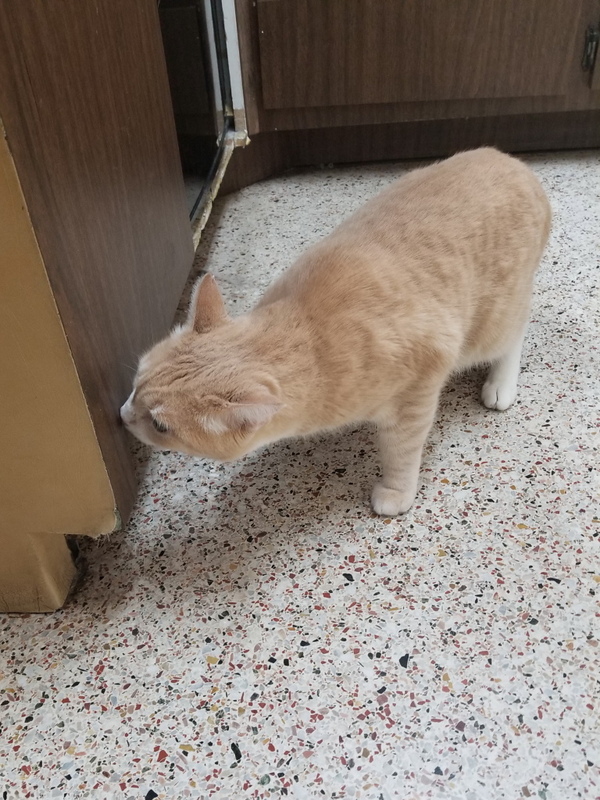 I have heard that vaccines could cause some problems so we hoped that he would be better after a good night’s sleep, but this morning he still seemed lethargic. Normally, I feed that cats in the morning, but Rose couldn’t sleep and got up early and fed them. I didn’t know it until later but she opened up another can of food because Floki was eating like a pig. About 9:30 this morning, Floki’s vet’s office called and I said he has been a bit lethargic. She asked if he ate and I told her he had. 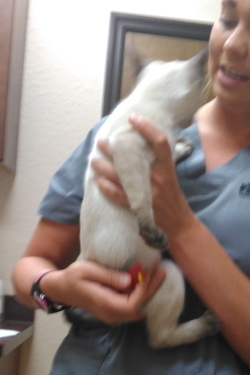 She then put me on hold and came back and said the vet would like to see him to check his temperature. I didn’t want to spend another $100 to have his temperature checked so I said I would talk to my wife. She then told me about how much Floki ate this morning so I called the vet back and said that he was eating fine and I was going to keep him home unless he got worse. Now all I can do is hope he doesn’t get worse. 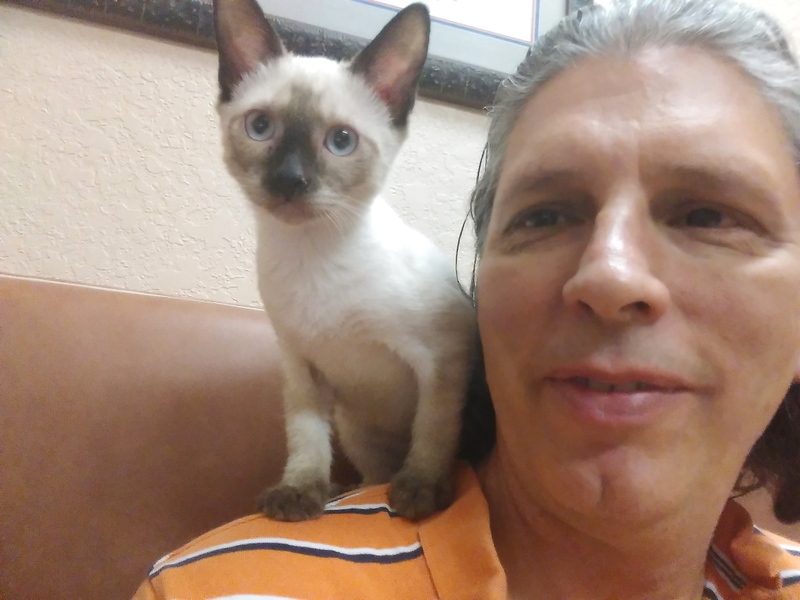 This entry was posted in Uncategorized and tagged cute, kitten, vaccination, vet on July 23, 2016 by Charles Huss.